Be the first to share your favorite memory, photo or story of Neva. This memorial page is dedicated for family, friends and future generations to celebrate the life of their loved one. 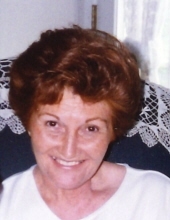 Neva Jean Hale, age 78 of Pikeville, died suddenly at her home Wednesday, April 10, 2019. Neva served her county as Register of Deeds for thirty-six years, elected in 1962 at the age of twenty-one. At that time she was the youngest state official ever elected to public office. She was a faithful member of Pikeville Church of Christ for over sixty years. Her only hobby was reading, but her passion was being around people and helping anyone she could. She enjoyed visiting the Nursing Home on a regular basis. Preceding her in death was her husband, Gerald T. Hale; parents, Hubert and Mae Mooneyham Simmons; brothers, Randell and Lewis D. Simmons; sister, Huberta Therrell. Those left to cherish her memories are her sons and daughters-in-law, Gerald Lynn (Jane) Hale, Murfreesboro and Greg (Jackie)Hale, Pikeville; grandchildren, Josh, Caleb, Sydnie, Logan, Emalee, and Nathan; sisters, Carolyn Hatfield, Annette “Cookie” Cox; several nieces, nephews, cousins, and a host of friends. A Celebration of Life will be 2:00 pm Saturday, April 13, 2019 in the funeral home chapel with Bro. Tony Britt officiating. Burial will follow in Wheeler Hill Cemetery. The family will receive friends 11:00am-8:00 pm CDT Friday, April 12, 2019 at the funeral home. In lieu of flowers the family request donations be made to the charity of your choice or the Pikeville Historical Society. "Email Address" would like to share the life celebration of Neva S Hale. Click on the "link" to go to share a favorite memory or leave a condolence message for the family.